From Main body of report: This accident, resulting in the loss of two lives, occurred on a main haulage road over which the hutches were led by means of an endless rope moving at a speed of about two miles per hour. A bogie, provided with clips for gripping the rope, preceded the rake. The road dips inbye, and snibbles were placed in the wheels of some of the empty hutches. An attendant rode on the bogie, but the miners were not allowed to ride on it or on the rake, and notices to that effect were posted up near the shaft bottom. At the time of the accident an empty rake of 12 hutches was being drawn inbye, and in these hutches the deceased men and others were riding. At a steep part of the road the hutch next the bogie left the rails; the attendant noticed this and at once detached the bogie from the rope, but the rake continued to move, although the hutches were snibbled in the usual way ; he attempted to stop the rake by placing his back against the bogie, but was unsuccessful, and the hutch that was off the rails displaced some timber supporting the roof and relieved some stone which fell upon the hutch in which the deceased men were riding. The under-manager was charged before the Sheriff with not enforcing the rule against riding in the hutches, but the charge was not maintained. From Main body of report: Deceased and another labourer named Patrick Cassidy were engaged in sending down fodder in hutches from the low scaffold, or surface level, to the Splint Coal. A pair of cages ran in the shaft, but only the rise cage was used for this purpose, and the engineman placed it in position at the low scaffold, where no shuts were in use, by observing the position of the crosshead of his right-hand engine. Coal was being raised at the time, and when a hutch of fodder was ready, deceased called to the engineman, who lowered the cage containing an empty hutch from the high scaffold to the low scaffold, where the empty hutch was taken off and replaced by a hutch of fodder; deceased then cried "There" and the engineman lowered the cage to the bottom. When the fifth hutch of fodder was ready, the cage was called for and was lowered to the low scaffold, but brought to rest about four inches too high. This did not prevent the removal of the empty hutch, but when deceased and Cassidy attempted to push on the hutch laden with fodder they found they could not accomplish it. Deceased then, according to Cassidy's statement, called to the engineman, "Lower a wee bittie;" they continued to push the hutch forward, the cage was lowered to the bottom of the shaft, and as it left the low scaffold the hutch fell into it, and rested on its end ; Cassidy fell with it, but caught the crossbar of the cage and arrived safely at the bottom; deceased was found lying in the cage dead, having evidently been crushed against the side of the shaft. The engineman, who was a steady and experienced man, stated he received a cry for the cage, and lowered it to the low scaffold, and then received the cry "There," on which he lowered the cage to the bottom, and was not aware of any accident having happened until informed by the manager some little time after. From Main body of report: This accident took place in a shaft 20 feet in diameter, which was being sunk at Newbattle Colliery. A feature in this sinking was the use of a permanent double-decked scaffold suspended on steel cables, from which the shaft sides were walled while sinking was proceeding below. Two large kettles running between the surface and the bottom passed through an opening in the centre of the scaffold, and loose riders, sliding on the cables suspending the scaffold, accompanied and steadied these kettles while they ran between the surface and the scaffold. A third and smaller kettle travelled between the surface and the scaffold for the use of the wallers, a loose rider (see plate) also moved with this kettle, sliding on the two parallel parts of a rope which passed round a sheave (to which a pump was attached), below the scaffold. The accident was caused by the rider of the small kettle sticking on the guide-rope's, and afterwards falling away, while deceased was descending on the kettle. At the time of the accident the shaft was 165 fathoms deep and the scaffold was hanging 35 fathoms from the bottom. The master sinker and deceased left the surface together, standing on the rim of the kettle. The former had no light, deceased had a lighted lamp in his hat when he commenced to descend, but it was extinguished before they arrived at a point 64 fathoms from the surface where the master sinker got off the kettle to attend to a pump stationed there and illuminated by an electric lamp, which enabled him to see that when deceased commenced to descend lower on the kettle the rider was following in the usual way, resting on the socket of the winding rope. The engineman who was lowering the kettle felt a sudden shock on the rope when it was within five fathoms of the scaffold; he at once stopped the engine. Some men were working on the lower deck of the scaffold, and they heard deceased and the rider fall on to the upper deck. The rider was still attached to the guide-ropes, but the hole in it through which the winding rope passed had broken open and allowed it to fall past the kettle. From Main body of report: This accident occurred at the foot of a "gurdy brae " or self-acting incline, 15 yards in length, and with an inclination of one in three. Deceased was employed as a dook-footer at an incline of 240 yards outbye, and in addition to his duties there ran the tubs between both inclines. Although no part of his duty, he attached an empty tub to the chain at the foot of the gurdy brae and signalled it away; when about halfway up the draw bar of the empty tub broke, and both tubs descended the brae, and before deceased could get out of the way he was struck by the loaded tub and crushed against the side. The drawbar broke at the first bolt hole; the break on one side of the hole was an old fracture, which, however, could not be easily seen as the nut partly covered it. From Main body of report: The first of these [shaft accidents] happened at Bardykes Colliery, to the bottomer at a mid-working who had signalled for the cage, and while it had been raised to the "door heads" to enable him to put a hinged needle across the shaft for it to rest upon, he seems to have forgotten to signal it down again. The consequence was that he pushed a full hutch into the open shaft and fell after it a distance of 22 fathoms, and received injuries to which he afterwards succumbed. 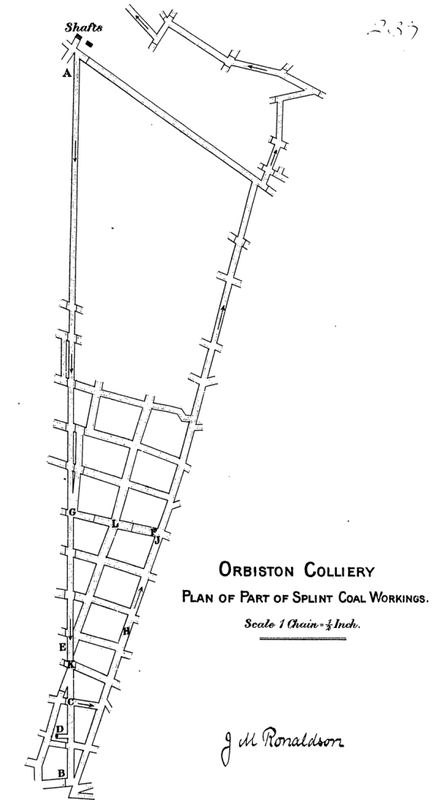 From Main body of report: This accident took place in a "Break Incline," which was in course of formation in the Corbie coal workings. The seam is 7 feet 3 inches in thickness; has a dip of 58 degrees, and is worked "Stoop and Room," the stoops being 30 feet in thickness, measured on line of dip, and the rooms or levels 9 feet in width. Upsets 4 feet by 3 feet 6 inches had been driven from each level to the one above by the miners in the ordinary course of working, until the top of the "fetch" of 54 fathoms was reached. The work of stripping the incline to the required width and height, setting the permanent timber, laying the rails, and generally completing the incline, was then let to a contractor, who took upon himself all responsibility in connexion with the regular inspection of the incline; and the safety of the workmen employed upon it, and therefore the regular fireman ceased to inspect it in terms of General Rule 4 (i). It was stripped from the top downwards, and when the accident took place it had been completed and the timber set to a point about 17 fathoms from the bottom. The deceased were engaged at this point, when about 20 tons of coal and blaes suddenly burst from the roof near the top of the incline, swinging the props and crowns which had been set under it. The debris swept down the incline, crashing through nine scaffolds on its way, and buried the deceased, killing them instantly. Proceedings were instituted against the manager (1) for failing to appoint a competent person to examine the incline before the commencement of the shift, as required by General Rule 4 (i); and (2) for failing to see that the results of such examination were forthwith recorded in a book kept at the mine for this purpose. He pled guilty to the second charge, and was fined in five pounds. From Main body of report: The next [shaft accident] happened at Orbiston Colliery to a pony driver, who was alone at the time, and in some unexplained manner fell from a mid-working. From Main body of report: This accident, which was witnessed by the manager of the colliery, was caused by the dangerous practice of using a prop to sprag a railway waggon. Four empty waggons were beginning to move down an incline of about 1 in 12, when deceased snatched a prop five feet long from a stack of timber and attempted to insert it between the spokes of one of the waggons, but not entering it far enough it was twisted out by the guard of the wheels and pressed flat against the body of the waggon ; deceased was either jammed between the prop and the waggon or he received a blow. He eventually fell across the rails and the next waggon passed over him. The manager, knowing the danger of using long props for spragging waggons, shouted to him to desist, but deceased, who may not have heard, continued his attempts, with the result stated. From Main body of report: Deceased was in charge of a horse which was pulling six empty waggons down a slight incline to the screens. When near the screens he attempted to pass below the tail chain of the horse while the waggons were moving, he slipped and fell and the four wheels on one side of the first two waggons passed over his left leg. From Main body of report: This accident; was caused by a fall of coal, and shows that although the rule as to spragging is faithfully carried out, accidents may occur. Deceased and his son worked together, and, as is usual in the district, left their place holed and the coal well secured with "gibs" on the Saturday previous to the accident. Between Saturday and Monday morning the coal had broken at the back of the holing and rested on the gibs. Deceased was engaged "mending" the holing, while, at the same time, the man who occupied the place to the left was holing out a "gavel" or unholed piece of coal at the march between the places. As soon as the gavel was out, the coal fell along the face, and deceased was so severely crushed that he died from his injuries a week afterwards. The gibs or sprags were sufficient to keep up the coal so long as the gavel was in, but immediately it was removed, they were no longer able to sustain the weight of the coal. While making inquiry into this accident Mr. McLaren discovered that some of the men were in the habit of going to their working places without first having received a report from the fireman that it was safe to do so, in contravention of General Rule 4 (i), and Special Rules (57 and 68, and prosecutions resulted. From Main body of report: Deceased signalled away a rake consisting of an empty hutch (permanently attached to the rope and called the chain hutch) and two hutches loaded with oil shale, from a platform on a dook dipping one in three, the haulage on which was performed by a steam engine on the surface working a single rope. When the rake started, and as it was passing round the curve at the bench, it left the rails and crushed deceased against a tree, which was displaced and caused a heavy fall of roof; the fall of roof did not, however, cause death, as deceased was clear of it. The attendant or chain runner whose duty it was to signal away the rakes was higher up the dook at the time; the rope had been taken down by the chain hutch, which had been derailed, and the chain runner after lifting it on to the rails had signalled it down, he remaining at the place to adjust the rails. From Main body of report: The fatal accident occurred at the face of a room in a limestone seam 4 feet 6 inches thick with a holing of 7 inches of blaes and 2 inches of coal. Deceased was holing, and his partner, who stood near with his hand on the block which fell, felt it coming. He sprang back and shouted to deceased, who, however, could not get clear, but was instantly crushed to death, the block weighing four tons. From Main body of report: Deceased was in charge of a horse which was employed in drawing the sets of empty tubs inbye over a flat portion of an engine dook. At the inbye end of this flat portion he uncoupled the horse and turned it aside into an old road-end, and, assisted by a drawer, pushed the tubs as they passed him until the increasing inclination of the road enabled them to pull out the engine rope. The horse became restive and pushed him against the tubs, which jammed him against the stoop corner. The drawer went to his assistance, when the horse again backed violently against deceased, fracturing his ribs and driving them into his lungs. From Main body of report: One man lost his life by a shot hanging fire, and by its going off just as he returned to it without having allowed the prescribed half hour to elapse. From Main body of report: Two miners fell off the cage in an unexplained manner while ascending the shaft at Glenbuck and Daldowie Collieries. From Main body of report: Deceased was engaged cleaning a wheel brae which was 76 fathoms in length, and had an average gradient of about one in one and three-quarters. When he was about the centre of the brae a stone fell from the roof or side near the top, rolled down, and struck him on the head, fracturing his skull. From Main body of report: Deceased was employed as bottomer in a pit 33 fathoms deep. While stooping to turn down the hutch guard on a cage which had just landed in the pit bottom, a piece of coal, which had apparently fallen from the newly ascended cage when it was set back upon the shuts at the pitmouth, fell down the shaft and struck him on the back of the head, causing a compound fracture of the skull. From Main body of report: This accident took place in the same pit as did accident No. 4, and was also caused by the fall of the rider of the small kettle, but under different circumstances. The shaft was sunk 185 fathoms at the time, and the walling scaffold was hung 25 fathoms from the bottom. Some rhones or water boxes were to be fixed to the side of the shaft, beginning 30 fathoms above the scaffold and extending some distance below it. The rhones were fastened at the surface to the rope of the small kettle, and the rider rested on a gland screwed to the rope 31 fathoms from the hose or socket, the rhones were then lowered into position and secured to the shaft side by workmen working from one of the large kettles, the rider of which was made fast at the surface so as to allow the kettle to be deflected from the perpendicular. When this work was finished the rope was detached from the rhones and the saddle hung on to the end, deceased got on to it and was signalled to the surface, the rider still resting on the gland 31 fathoms above him: after ascending about 30 fathoms the rider fell away, knocked deceased off the saddle and fell with him on to the walling scaffold. From Main body of report: Deceased, a roadsman, was crushed by the descending carriage on a dook extending from the surface and inclined at about 34 degrees. He was descending on foot from No. 8 to No. 9 bench. From No. 8 to No. 10 bench canvas brattice was carried down the dook, and behind this brattice there was ample room for any person to pass clear of the carriage, but deceased travelled on the carriageway. There were no manholes in the dook between Nos. 8 and 9 bcnches, and it was a question with me whether this was a contravention of General Rule 14, which provides that "Every underground plane on which " persons travel, which is ... worked by an engine . . . shall be provided . . . with sufficient manholes for places of refuge, at intervals of not more than twenty yards." This dook was ordinarily traversed by the miners and others on the carriage, and only on special occasions was it travelled on foot. Deceased could have had the use of the carriage had he desired it. Under the circumstances I did not advise a prosecution. At the same time I would point out to managers that on any such road which is ordinarily travelled on foot, even if only by officials, manholes are necessary in order to comply with the General Rule quoted. From Main body of report: Deceased and a number of other workmen had gathered at the pit bottom at the close of their shift, and were waiting their turn to ascend. The dip cage had been sent up with both of its decks loaded with men. The engineman, in accordance with the regular custom at the pit, stopped it with its upper deck level with the plates at the pithead, thus setting the lower deck of the rise cage level with the plates at the pit bottom. Deceased forthwith stepped upon this cage without waiting for the bottomer's permission, and before any one could see his intention or stop him. Some of the workmen shouted to him to come off until the cage was lowered and its upper deck set level with the plates. He attempted to do so, but was caught by the cage, his head being crushed between its upper deck and the plates of the landing, and his skull fractured. The winding spaces in both sides of the shaft at the pit bottom were fenced with horizontal bars of iron, hinged at one end. The accident would have been prevented had the fencing bar on the rise side not been raised until the cage was properly set. Deceased had only been employed underground for about six weeks. From Main body of report: This accident was caused by the slipping from its place of a bar or crown, 9 1/2 feet long by 7 inches square, put in for the support of the roof and sides of a carriage and pumping dook lying in the Kailblades seam and inclined at 30 degrees. After falling out the bar slid 40 fathoms to the foot of the dook. The dook is about 9 feet by 6 feet sectional area. 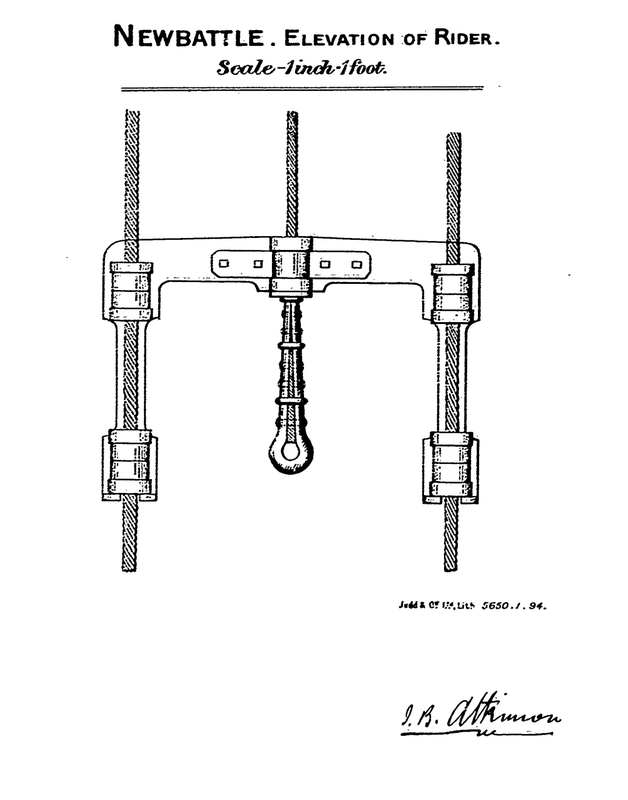 The bar had been notched into the coal sides, and the side pressure usually fixed such bars firmly, but in this case the coal supporting the ends of the bar must have fallen away and the side pressure had not been applied. The empty carriage was descending at the time for the miners who were congregated at the dook foot. The carriage was derailed at the place from which the bar fell, but whether this caused the fall or was the effect of it could not be determined. Deceased was climbing on to the dook from a side entrance, two or three feet below the floor of the dook just as the bar arrived at the point, and he was killed instantly. The dook was examined daily by the officials, all of whom traversed it on the carriage, from which they could see the whole of it, but no danger had been observed. From Main body of report: Deceased worked at the foot of a dook, which extends for a distance of about 50 fathoms from the pit bottom, and has an average dip of one in five. The tubs are drawn up one or two at a time by an open ended rope worked by an engine at the dook head: no one was permitted to ride on the tubs or travel on the dook behind the loaded set. Contrary to this regulation, deceased had travelled up behind two loaded tubs for a distance of about 15 yards, when the tubs ran back upon him, owing to a rivetted muzzle pin in the coupling chain, by which they were attached to the rope, having given way. Deceased slipped and fell between the rails, and the tubs ran over him, fracturing his ribs and crushing them into his lungs. There was a fork 3 feet 1 inch in length attached to the rear coupling of the second tub, but it failed to hold or derail them in time to save him. 1893 July 11 7am Kelty Fife Fife Coal Co Ltd Angus Stewart Labourer 56 Above ground 1st Run over by waggons. From Main body of report: Deceased, a labourer, was killed by being run over by a waggon half full of coal, which was being pushed forward by a locomotive engine, which was at the same time drawing three empty waggons. The noise from shaking screens and travelling belts was considerable, and deceased appeared not to have heard the waggons. The driver of the locomotive saw that deceased was in danger and he blew the whistle and the shunter applied the brake, but the wheels skidded, and deceased was run over by the waggon preceding the engine. From Main body of report: A pony having run away with a hutch of ashes, the driver fell and was run over. From Main body of report: The other fatal explosion of firedamp happened in Hattonrig Colliery to a fireman, who previous to entering some old workings with two men to lift rails, lighted his safety lamp to make an inspection. As if to make sure of detecting firedamp if there was any, he took his naked light along with him. Unfortunately he did find firedamp, which is, no respecter of persons when a naked light comes in contact with it, and he paid for his folly with his life. From Main body of report: The sixth fatal shaft accident was evidently caused by an unexploded dynamite charge being drilled into in a sinking pit at East Parkhead Colliery. In this case it appears that the sinkers were intending to make use of part of an old shot-hole, and two of them were about to drill it deeper with a jumper. The deceased held the jumper, while the other struck it with the hammer, when a violent explosion took place, killing one and injuring the other. So far as I could learn, no one knew that any previous shots, several of which were fired at once, had failed to go off. From Main body of report: A waggoner, after putting a sprag in a wheel of a waggon at rest, was knocked in front of the wheels by the sprag, when another waggon struck the waggon at rest and set it in motion. From Main body of report: The accident took place on a dook which extends for about 57 fathoms from the pit bottom. The gradient varies between one in three and one in six, and the tubs are drawn up in sets of two by an open ended rope worked by an engine on the pithead. A wire is stretched along the centre of the dook by means of which signals can be made from any part of it to the pit bottom, and the bottomer there repeats any signals received to the engineman at the pithead. Deceased was employed by his stepfather, and had only commenced to work in the dook on the night on which the accident occurred. He was instructed by the fireman to travel up and down the dock with each set of tubs, in order that if they left the rails he could at once signal to the bottomer and have the engine stopped. When coming up in front of his first loaded set his head came in contact with a low crown which knocked off and extinguished his lamp. He tried to catch the signal wire to stop the set but tripped and fell in front of it, and was severely crushed between the tubs and the side of the dook. He died on the same day. The practice of travelling upon an engine plane having such a gradient while the tubs are in motion is an exceedingly dangerous one. The attention of the owners was called to it, and they agreed that it should be discontinued forthwith. From Main body of report: This accident was caused by the descending empty carriage on an incline, from the surface, dipping from one in one and a half to one in three, striking deceased while he was ascending on foot. The carriage ran on rails laid to a gauge of 3 feet 6 inches; it held three hutches, and weighed about 30 cwt. The incline was not used as a travelling way, all persons traversing it on the carriage. A companion incline was used as a travelling way, which deceased should have used, but it appeared that he did not expect the carriage to descend below a bench to which he was proceeding and from which he intended to ride to the surface on the carriage. The carriage called at several benches, and on the occasion of the accident the engineman was in doubt where it was next required, and he allowed it to run past the bench deceased was climbing to. From Main body of report: Deceased was employed as a locomotive shunter. The locomotive engine pushed ten empty waggons and nine waggons loaded with dross, into a spare lye. where the loaded waggons were to remain; they were uncoupled by deceased, and the empty waggons were drawn away by the engine. The loaded waggons commenced to move in the same direction, and to stop them deceased inserted a sprag in one of the wheels, and was attempting to put a prop into another wheel. He did not insert the prop sufficiently far and it swung round and threw him under the moving waggons. From Main body of report: The death of a sinker from lung disease following a slight accident received while at work and from which he had apparently recovered. From Main body of report: Deceased was crushed between the buffers of an empty and loaded waggon, which along with others were being moved on the colliery sidings by a locomotive engine. He had uncoupled the two waggons between which he was crushed, and had given a signal by waving his arm, which was understood to mean "back slowly," he then attempted to pass between the waggons, which were slightly apart, and was caught while doing so. It appeared to me that there had been some misunderstanding of the signal given, and that deceased had not expected the waggons to collide. Deceased was employed by the North British Railway Company, on whose system the colliery is situated, and who not only led the coal but worked the traffic about the screens and on the colliery sidings by a staff specially appointed for that purpose, acting, in fact, as contractors for doing work which otherwise would have been performed by the colliery owners. From Main body of report: Deceased drew coal from the face of a level in the Peacock Tail Seam to the brake incline, a distance of about 200 yards. The level was 40 yards from the bottom of the incline, which was very steep, from 60 degrees to 70 degrees. The incline was worked by a carriage and back balance in connexion with a drum at the top of the incline. At the entrance to the levels the signal lever was so arranged that when lowered it extended across the level and acted as a fence; each lever was connected with a separate hammer fixed near the drum. It appeared that the levers were not used either for signalling or as a fence; the signalling was done by cries from the levels to the brakesman. Deceased left the face of the level, pushing a loaded hutch. He ran it into the incline and fell with it. The hutch fell on to the carriage, which was at rest a few feet from the bottom of the incline, but deceased fell to the bottom into a small sump about four feet deep and filled with water, where he lay for 15 minutes. A boy near the foot of the incline heard the fall and raised the alarm, but not much attention was paid to it, and as he could not see deceased it was not then known that anything serious had occurred. On deceased being extricated from the sump he was dead. He was much injured by the fall, but, probably, the immediate cause of death was drowning. From Main body of report: The explosion took place at the top of a self-acting incline in the Five Feet Seam of No. 7 Pit, Cowdenbeath Colliery: the seam has an inclination of 1 in 2 1/2, and is worked long-wall. Gas had been seen in the section occasionally during nine months previous to the accident and was seen by the fireman when making his inspection on the day of the accident before the entry of the workmen ; the place in which the injured man worked, which was the highest level, was found clear of gas but the heading or place above the wheel contained gas, and as the fireman allowed deceased and another miner to proceed to their work with naked lights they ignited this gas when engaged near the wheel preparing for the running of hutches. The fireman stated he had forgotten that the miners would require to approach the place where the gas lay. He was charged before the Sheriff with a breach of Special Rule 38, which provides for the examination by the fireman of working places, and the course to be pursued in the event of gas being found, he pled guilty and was fined 2l. on agreeing to subscribe 3l. to Edinburgh Royal Infirmary. The accident took place on the 13th November, and deceased was removed, on serious symptoms appearing, to the Edinburgh Royal Infirmary, on the 29th November, where he died a day or two after admission. It is not improbable that had he been taken to the infirmary at once he would have recovered. From Main body of report: This was a singular case, and perhaps should not have been classed as an accident. Deceased was employed as bottomer at a shaft. He was an aged and not a healthy man. He left his post at the shaft bottom about 9 a.m. on the 14th November, and it was understood by persons there that he had gone to a small ventilating furnace at the bottom of another shaft, about 100 yards away, to warm himself. There was another shaft still further away, fitted with ladders to the surface, and the road to this shaft coincided for a considerable part of the distance with the road to the furnace. He did not return to his work, and search was instituted the same day and on several succeeding days, but he could not be found, and it was supposed he had climbed the ladder shaft to the surface. Search and inquiry made on the surface led to no result, and search was recommenced underground, and, eventually, on the 2nd December, his body was found about 90 yards from the furnace in the return air way, or rather in a confined road next the rib side adjacent to the return air way. A post-mortem examination was made and his heart was found to be diseased. The probable explanation seemed to be that he had lost his way and, in his confusion, he had crawled to the point where he was found and died from heart disease. From Main body of report: This accident took place in an old shaft which was being re-opened. A lift of pipes had been put in, and the crane rope had been left attached to the uppermost pipe about three feet below the pitmouth. Deceased and another sinker had subsequently been engaged in repairing the midwall, and had come up for breakfast, leaving the scaffold on which they had been working hanging on the engine rope, a few feet below the pitmouth. The engineman then pinned down the lever of the brake upon his winding drum, threw the drum out of gear and set the engine running to fill up the boilers. Deceased having finished breakfast, wished to use the crane rope for some purpose, and without informing the engine-man of his intention, leaped down upon the scaffold in order that he might reach and disengage the crane sling. The consequent jerk on the winding rope caused the brake to slip, and the scaffold dropped smartly for a few feet. The underground fireman was in the engine-house at the time; he threw his weight upon the brake lever and at once stopped the drum. Owing to its sudden stoppage, or to a corner of the scaffold having caught on a bunton, it tilted, deceased slipped off, and fell a distance of about 13 fathoms into the water which was standing in the shaft. He is believed to have struck some floating timbers which caused a fracture of his left thigh and a flesh wound on his right leg. He died the following day. From Main body of report: The third accident by falling from a mid-working took place at Abercorn No. 2 Pit, and befel the bottomer who expected one cage to be sent up to him from the low bottom, but as the engineman was at the time lowering men to the bottom in the other cage, the ascending cage did not stop at the mid-working. The bottomer evidently thought that the ascending cage had stopped, and he pushed a loaded hutch into the shaft, fell after it, and was killed. From Main body of report: This accident took place in a brake incline which is about 40 fathoms in length, and has an inclination varying between 65 degrees at the top of the incline and 97 degrees near its foot. The loaded tubs are placed, one at a time, upon a carriage which runs on one side of the incline, and are lowered to the horse road at its foot; the weight of the loaded carriage raising a back balance which runs on the other side of the incline, and which in descending again raises the carriage bearing an empty tub. Owing to the varying inclination the loaded carriage occasionally stops, especially if the tub upon it has not been sufficiently loaded. Deceased had come outbye with a loaded tub, which when placed upon the carriage, proved to be too light to take it down. The brakesman and a drawer, observing this, stepped out upon the incline, and, by pulling down the rope, kept the carriage in motion for a distance of about 13 1/2 fathoms. They then shouted for further assistance, and deceased, knowing that his tub was on the carriage, ran forward to assist. On reaching the incline he tripped or slipped over the bench, and fell headlong down upon the carriage, breaking his neck. The entrance to the incline was fenced by a horizontal bar, as is usual at the colliery, but when going out on the incline the brakesman had pinned up this bar in order that it might not impede his return to the brake lever when the carriage began to move away again. The brakesmen and drawers are forbidden to go upon the incline under any circumstances. A strict compliance with this regulation would prevent many accidents in these edge workings. From Main body of report: This accident took place at the end of a siding at the junction of the owner's branch railway with the main line, at a distance of about two miles from the pit. Deceased and some other labourers were sent to do some work near the junction, and had ridden down on the top of some waggons loaded with oil shale. As the waggons were being shunted back into the siding the men proceeded to get down, but the guard warned them to remain seated until the waggons had stopped. Deceased, who was on the second waggon, however, got over its front end and stood upon the buffer. The leading wheels of the front waggon dropped over the ends of the rails, the rear buffers were tilted up and overrode that on which deceased stood, severely crushing his right leg below the knee. He died on same day from shock and loss of blood. From Main body of report: This was the only fatal accident to a woman about the mines in the district, and was caused by deceased, who was a pithead worker, attempting to remove a piece of coal from the bottom deck of a double-decked cage, after a signal had been given to the engineman to place the top deck level with the pithead. She was crushed between the cage and plates.